Dave Roman, Raina Telgemeier and John Green will be returning to the Toronto Comic Arts Festival! this weekend! The guest list includes hundreds of other amazing artists from all over the world! And best of all, the event is totally FREE! 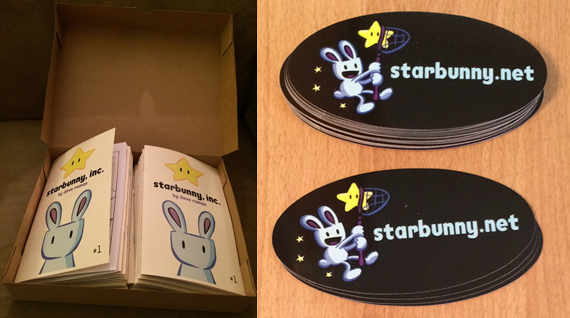 We’ll be at TABLE B4 (on the first floor), and Dave will be debuting his new mini-comic called Starbunny, Inc. and giving out free stickers with each purchase! Dave, Raina & John will be involved in tons of cool programming you will want to check out! Programming is spread out amongst several separate buildings, so be sure to double check the address for each! 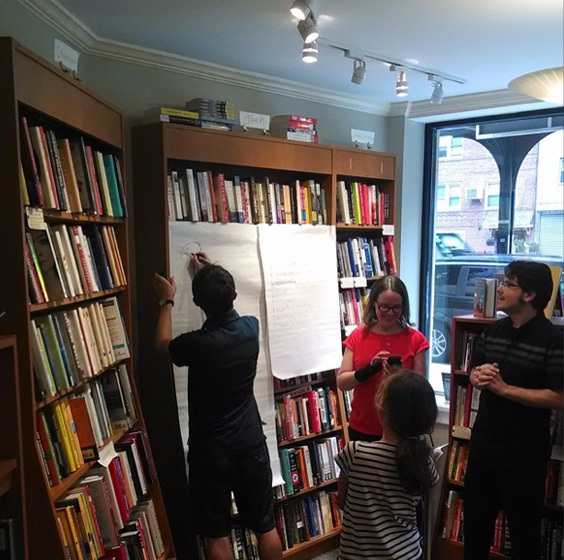 What makes an author or artist visit to your library awesome? 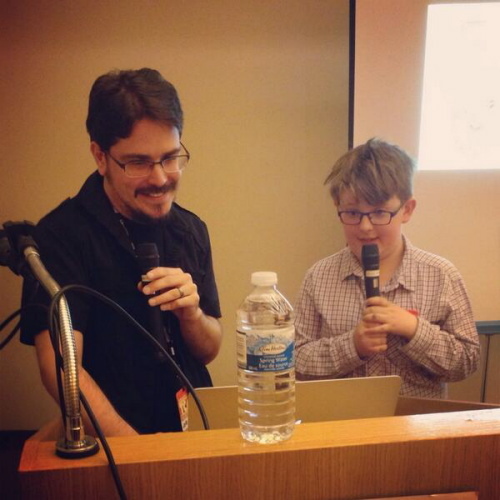 What can you do to get the most out of the time comics creators spend with kids? 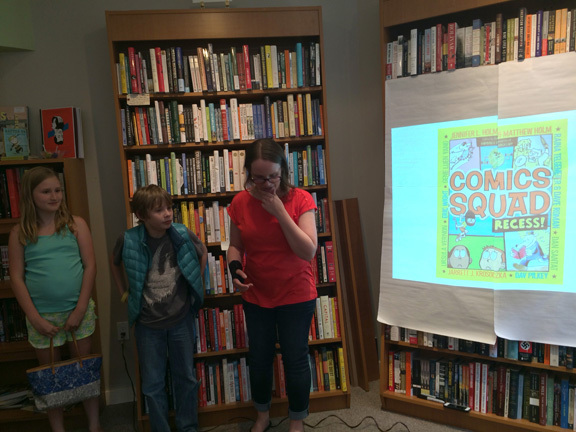 Renowned cartoonists Raina Telgemeier and Lynn Johnston have been guests at dozens of libraries throughout their careers. Join them as they discuss the dos and don’ts of hosting comics creators in your school or library! Doors at 7pm. Presentation at 7:30pm. Two of Canada’s most beloved strip cartoonists join together to discuss their careers and officially open the Toronto Comic Arts Festival 2014! 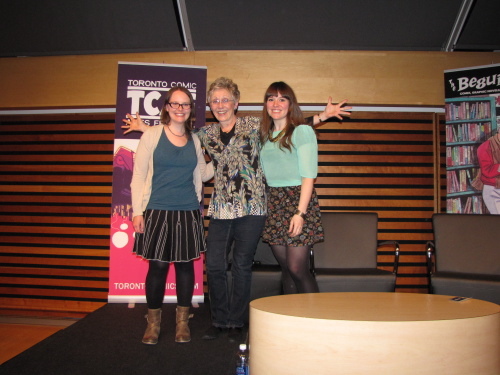 Lynn Johnston and Kate Beaton have each garnered enormous followings with their unique voices and atypical cartooning beginnings. Moderated by cartoonist Raina Telgemeier. Dave Roman’s Astronaut Academy, and Ben Hatke’s Zita the Spacegirl! On the occasion of the much-anticipated release of The Return of Zita the Spacegirl, join creator Ben Hatke to welcome her back! Ben will be joined by author and artist Dave Roman (Astronaut Academy), and they will both present from their newest works. 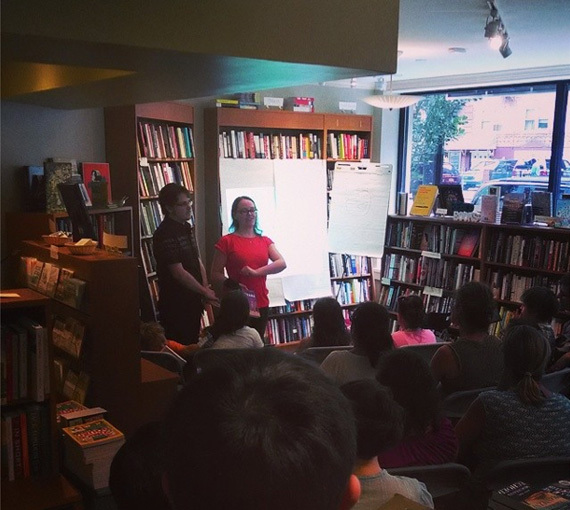 Getting Real with Raina Telgemeier and Jimmy Gownley! Join Raina and Jimmy for live performances from their real-life graphic novels, Smile and The Dumbest Idea Ever! Audience participation will be encouraged, so bring your best voice-acting talent! Signing to follow! A fast-paced game show where volunteers are paired off with (or against) professional cartoonists in a series of fun-filled drawing challenges! Audience members will provide suggestions and add to the creation of totally improvised epic drawings! Featuring hosts Dave Roman (Astronaut Academy), Alec Longstreth (Phase 7), Jason Caffoe (Explorer: Lost Islands), John Green (Teen Boat! 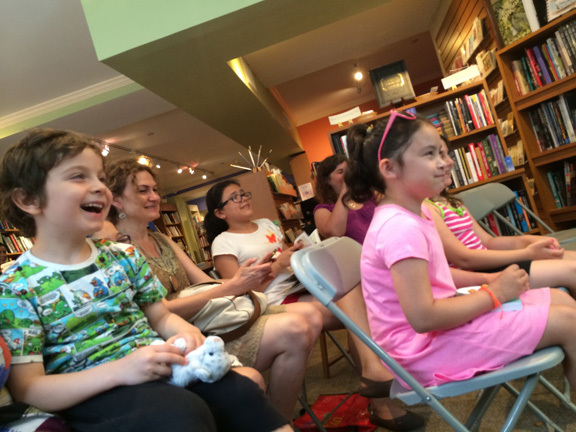 ), Frank Cammuso (Misadventures of Salem Hyde) and Raina Telgemeier (Drama)! Great for all ages! A live performance involving lots of audience participation and silliness. Raina Telgemeier (Drama), Dave Roman (Astronaut Academy) and John Green (Teen Boat!) 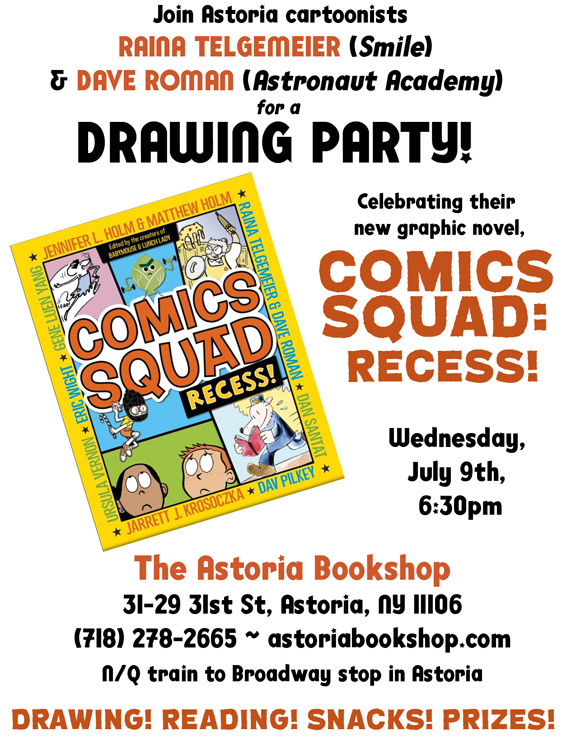 will perform chapters from their all-ages comics including one from the soon to be released anthology, Comic Squad! With Kazu Kibuishi, Raina Telgemeier, Britt Wilson, John Martz, Paul Pope, and moderator Scott Robins! This is your chance to win a rare advance preview copy of SISTERS!! You must be in the audience of this panel in order to qualify! 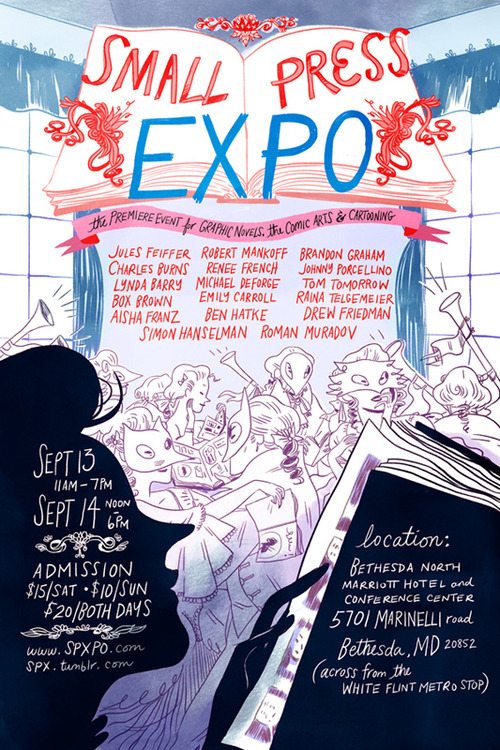 Dave Roman, John Green and Raina Telgemeier will be at be at the Small Press Expo in Bethesda, MD September 10th & 11th. You can find them at Table F16 in front of their new Astronaut Academy banner! 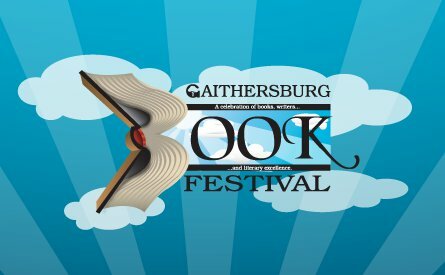 Dave Roman and John Green will be attending the MoCCA Art Fest. They’ll be sharing a table with their buddies Zack Giallongo and Travis Nichols. 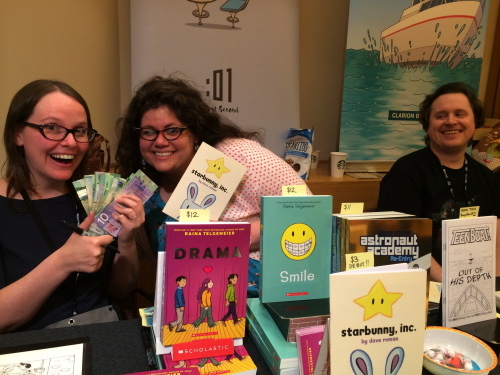 Meanwhile, Raina Telgemeier will be a guest at Teen Book Con in Texas! So if you can make it to either event, please do! Dave and Raina will also be at the Texas Library Association conference the following week in Austin Texas partying with librarians and educators.